On Tuesday, Senators Ben Cardin (D-Md.) and Roger Wicker (R-Miss.) introduced the S.1098, the Transportation Alternatives Enhancements Act to help communities like yours build better bicycling and walking infrastructure, like trails, pedestrian and bike bridges, and other projects that connect us with where we want to go. The bill makes several improvements to the existing Transportation Alternatives (TA) program, which accounts for almost half of all federal funding for bicycling and walking infrastructure, by making TAP funding more available and easier for local governments to access meaning better biking and walking infrastructure for people like you and me. Ask your senators to support the S.1098 Act today! Get ready to get wonky. 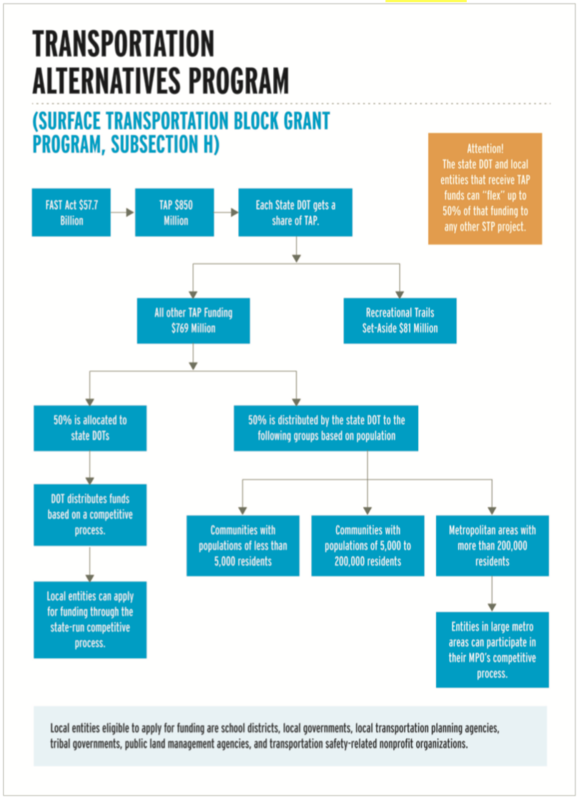 Currently, TA is a subsection of the Surface Transportation Block Grant Program (STBGP). Once states receive their allocation, that funding is divided evenly into two pots, both of which must go through a competitive process. The first is a state Department of Transportation competitive process, and the second half is further divided into three pots of money for communities based on population size. This ensures small communities only compete with small communities. Local Control Large MPOs (200,000+) can award projects but not obligate TA funding Allows Large MPOs to obligate TA funding Improve obligation rates and takes burden off of states. Ask your senators to support S.1098 and make biking and walking better in your community.